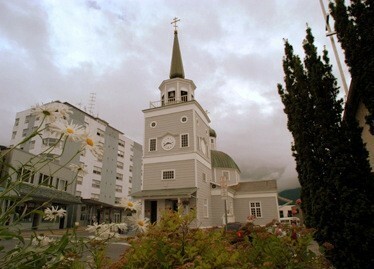 St. Michael’s Cathedral is located right in the middle of downtown Sitka. In fact, Lincoln Street goes around the Cathedral as a “round-a-bout’. The Cathedral is only three blocks from the waters of Pacific Ocean. The Cathedral Dome, Cross and Bell Tower can be seen from most of the vantage points in town. 9:00 AM Hours, 9:30 AM Divine Liturgy. 6:00 PM Akathist to St. Herman. 6:00 PM Akathist to the Theotokos - Sitka Mother of God. During the tourist season (May through September) the Cathedral is open 9am to 4 pm when Cruise ships have docked. At all other times, tours are welcomed by calling for an appointment. The Cathedral of St. Michael the Archangel was constructed between 1844 and 1848. St. Innocent Veniaminov was the designer of the Cathedral and built the clock in the original edifice. St. Innocent hired skilled Finnish carpenters to build the Cathedral, made of spruce logs and ceilings, and the walls were lined with sailcloth for insulation and acoustics. St. Michael’s Cathedral is the principal physical representation of the Russian cultural influence in the 19th century in North America. From 1840 to 1872, Sitka was the See of the Russian Orthodox Diocese which governed all of North America, and thereafter it continued as the See of the Diocese of Alaska. The present Cathedral is a reconstruction of the original building which burned to the ground on January 2, 1966. Over 95% of the original icons, pieces of Russian Orthodox art and religious objects were salvaged by 100 people of the town forming a human chain. These treasurers now adorn the Nave in the rebuilt structure. Inside the walls are still lined with sail cloth for acoustics and in memory of mariners who have lost their life at sea. In the center of the Nave stands the Cathedra built be St. Innocent himself. The Cathedral has three chapels: one dedicated to St. Michael, one to St. Innocent and the third to “Our Lady of Sitka”. Adorning the iconostasis of this third Chapel is the wonder-working icon of the Sitka Mother of God. St. Michael’s is an active parish of the Alaskan Diocese offering regular Liturgical services and support to the larger Sitka community. There are approximately 55 active members with the largest majority being native to Alaska (Tlingit). The services are held in English with many hymns and responses sung in Tlingit, Aleut, Yupik and Slavonic.